When an entire roll of film taken at the Keukenhof Gardens in the Netherlands came out blurry, Shalee Cooper decided it was time to study photography. After returning from her study abroad, she enrolled in the foundation program at the University of Utah, and has made Salt Lake City her home base ever since. Working out of a downtown loft, Cooper has built a local and international reputation as a photographer, curater and art professional. Her varied body of work — which includes high contrast silver prints, polaroids, Holga prints and color work — is influenced, she says, by the different tools of her trade. They are tools she has learned to use well. Now when her work is out of focus, as it was for an exhibition at the Rose Wagner in 2010, it’s on purpose. 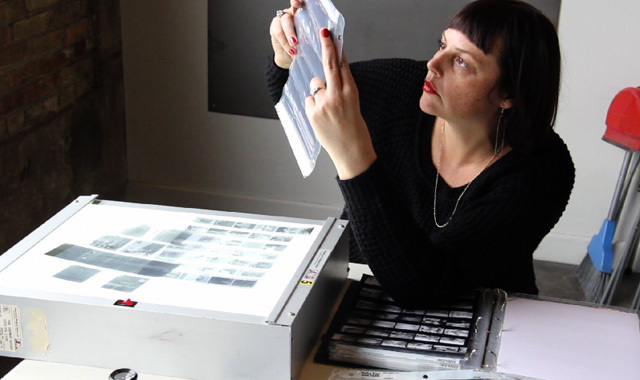 In this video interview, the former 15 Bytes image editor and current Gallery Director at Alpine Art allowed us to visit her live/work space, where she discussed mixing chemicals, blurring lines and the struggle to get her first camera. Watch the video profile in the February 2013 edition of 15 Bytes. Well done, Shalee. I enjoyed hearing you comment on your work. Shalee, I loved getting to see you and hear your voice. It was interesting to learn about your photography journey so far and fun to wonder where it might take you next! I learned a lot. It’s refreshing to see someone have a passion for their work. Thanks for sharing. Alles gute!